On May 3rd ICE will play the music of Kaija Saariaho in the perfect cube that is Calderwood Hall. The arts, architecture, and music worlds are all abuzz about this new music performance space at the Isabella Stewart Gardner Museum in Boston. ICE plus Saariaho plus a chance to visit our Boston family was already enough to tempt us to add this concert to our agenda. An investigation into the venue put us over the top. The idea of the performance hall is like a wood harmonic chamber, in which people enjoy sound, but they also enjoy looking in the eyes of the man or the lady in front of them. It's a kind of participation where you enjoy music, together with other people enjoying the same music. This sense of belonging is great and beautiful. As soon as you get in that space, it's about music, but it's something magical as well. 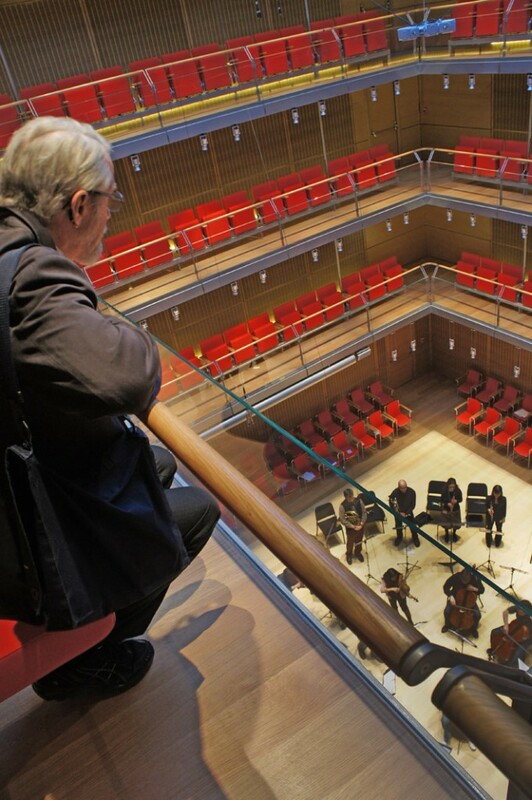 The excellent online music journal The Boston Music Intelligencer has a fascinating, in-depth discussion of Calderwood Hall’s visual and acoustic features by David Griesinger, a physicist who works in the field of sound and music. They have also generously agreed to let us re-use their photos. We are eager to see how ICE will decide to utilize this exciting new space, and even more eager to hear the results. Stay tuned for our follow-up report on the concert.